Connor Hellebuyck – Winnipeg Jets: Hellebuyck is coming off a strong performance in Montreal on Thursday, but the Jets still suffered an ugly loss. They’ll take on the Rangers, Avalanche and Senators at the MTS Center. Hellebuyck will be a terrific fantasy option next. Andrei Vasilevskiy – Tampa Bay Lightning: The Bolts will play three tough matchups against the Flames, Stars and Canadiens, but all three of those games will be played on home ice. Vasilevskiy will continue to be an elite fantasy option in all fantasy formats. Pekka Rinne – Nashville Predators: The 36-year-old has won two of his last three games and he’s given up two goals or fewer in each of those victories. The Predators will a pair of home games against the Red Wings and Canadiens before traveling to Vegas on the weekend. Marc-Andre Fleury – Vegas Golden Knights: Fleury and the Golden Knights have three home games next week, but two of them will come against elite teams like Toronto and Nashville. Fleury heads into the weekend with a 29-15-4 record with a 2.48 goals-against-average and a .912 save percentage. Jordan Binnington – St. Louis Blues: The Blues netminder has rattled off four consecutive victories and he’s given up just five goals during that stretch. He’s coming off a shut out of the Tampa Bay Lightning on Thursday night. The Blues have a home game against the Devils on Tuesday, but they’ll hit the road to take on Arizona, Colorado and Minnesota. Carter Hart – Philadelphia Flyers: Hart has been terrific since being recalled from the minors. He’s won each of his last seven games and he’s given up two goals or fewer in four of those outings. The Flyers will play a pair of back-to-backs next week, as they’ll play at home against Pittsburgh and on the road in Minnesota on Monday and Tuesday before playing a home-and-home series against the Red Wings on the weekend. Matt Murray – Pittsburgh Penguins: Murray heads into this weekend having lost three of his last four games. He’s given up at least three goals in each of those defeats. The Penguins will travel to Philly on Monday before they return home to take on the Oilers, Flames and Rangers. Robin Lehner – New York Islanders: Lehner has given up two goals or fewer in seven consecutive games. The Isles will play in Buffalo and Columbus on Tuesday and Thursday. They’ll host Edmonton on Saturday night. John Gibson – Anaheim Ducks: The Ducks will be going back home after a disastrous road trio out East, but that probably won’t fix their issues. They’ve been horrendous, which means Gibson can’t be trusted. 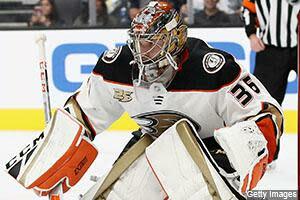 He was keeping them in games at the beginning of the year, but the Ducks netminder looks totally worn out. Avoid him. Jimmy Howard – Detroit Red Wings: After winning back-to-back games against Edmonton and Toronto, the Wings dropped a decision to the Golden Knights. Detroit will travel to Nashville on Tuesday and they’ll return home to play Ottawa on Thursday. They then have a home-and home series against the Flyers on the weekend.